Fact Check: 3 Questions Answered About Bill Clinton's LLC : It's All Politics Does Bill Clinton have a secret corporation that he is using to hide money? Is it intended to pay a lower tax rate? Or is it something else entirely? 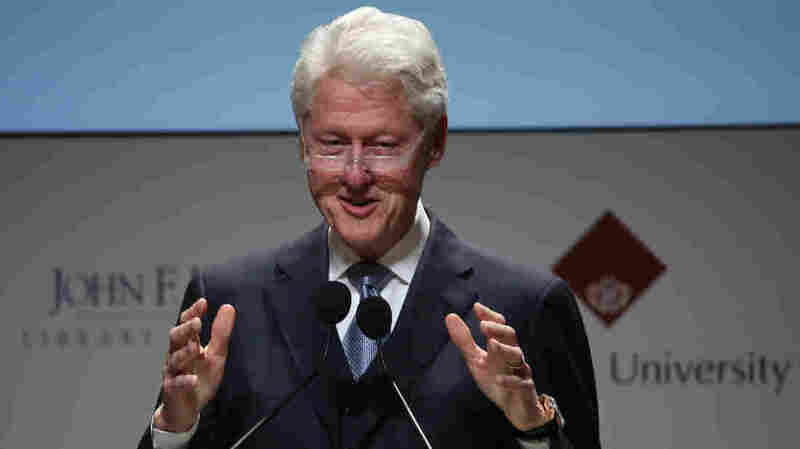 Bill Clinton and his wife, presidential candidate Hillary Clinton, are facing renewed questions about their finances. Another day, another inquiry into the finances of Hillary and Bill Clinton. This one starts with an Associated Press report that a limited liability company — WJC LLC — has served as a platform for the former president's career as a consultant. Revenues flow through it to the Clintons. It has never appeared in Hillary Clinton's official financial disclosures. "President Clinton set up a commonly used mechanism to manage his personal business affairs. All of the income has been reported and is accounted for. Anyone trying to paint this as anything more than that is playing politics." "Did they use the LLC for tax advantages or as a passthrough for payments from people and/or companies whom the Clintons would rather not be connected to publicly? Does Hillary have an LLC of her own ("HRC, LLC" or, better yet, "POTUS, LLC")? I figured they already had all the slush-fund money they needed from the Clinton Foundation, but now here's a rich new vein of secret income for the media to investigate...."
Hillary Clinton's presidential campaign did not respond to request for comment. 1. Is the LLC hiding income? LLCs are not designed to do that. Officially, they are "disregarded entities." Welcome to the tax code. In other words, it means their income is treated as the owners' income. 2. Then is it hiding the identities of Bill Clinton's clients? Or their payments to him? No. The tax code safeguards the privacy of such sensitive taxpayer information. It's the same law that protects your income sources, or the political transactions of a 501(c)(4) "social welfare" group, from public disclosure. The LLC also has no impact on Hillary Clinton's official personal disclosures. All that's required by federal law is the name of her spouse, provided he made more than $1,000 a year. It's true that the Clintons could provide a list of Bill's post-presidency clientele, but there's no law that compels them. 3. So, why have an LLC? The lawyers NPR spoke with all avoided saying there's nothing wrong here, but the main point of LLCs is to protect against lawsuits. If Bill Clinton was sued for consulting misdeeds, the LLC would be the defendant. Its assets would be at risk, but not the rest of the Clinton family's wealth. A good insurance policy for the LLC would offer even more protection. This isn't to say that WJC LLC would have assets of its own. It's common to sweep the cash out of LLCs, leaving the insurance policy to demonstrate the company's viability as a shield. There are other complicated factors that could change details of WJC LLC's role. But secrecy seems an unlikely motive. Not when the company is named for William Jefferson Clinton.